Rube Goldberg (1883-1970) was an American cartoonist, sculptor, author, and inventor. He is best known for his cartoons depicting complex machines and devices that perform simple tasks in an overly elaborate manner. While he never physically built any of these machines, his cartoons have inspired countless numbers of engineers, inventors, and dreamers to come up with their own machines to accomplish simple, everyday tasks. So our CCM Rube Goldberg Machine didn’t actually perform much of a task. I actually struggled with the what the “task” would be that our machine would accomplish since JP and I came up with the idea for the workshop. 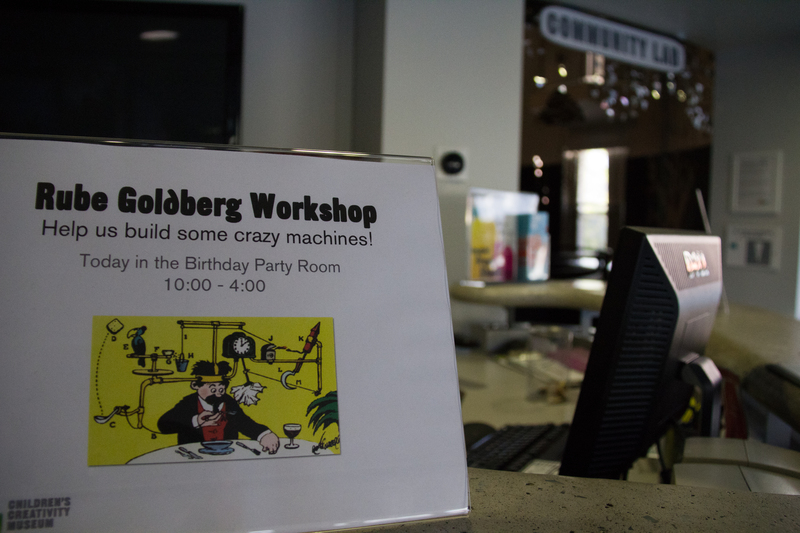 Furthermore, charged with the task of designing a workshop for kids on Spring Break, how would we set up such a complicated machine while still leaving kids the freedom to devise the solutions. Rube Goldberg machines are complex and fragile. The challenge was, and always is here at CCM, how to provide kids with just the right amount of inspiration and instructions so that they could feel free to be creative within the context of our workshop. Then sometime on Friday it hit me. Look at how creative the solutions were that the kids came up with, even with no actual goal in sight! I was frantically trying to come up with an ending, when in the end the kids never cared about the ending in the first place. I have never had so much fun, stress, and inspiration packed into a single event. Watching kids problem solve with a room full of materials at their disposal is one the true pleasures that I have working at CCM. Kids figured out innovative solutions to send marbles and dominoes around the room in ways that I never could have imagined. I guess it’s just another reminder that you’re never too old to learn something new, especially from unexpected places. In the end, Aha lost his marbles and we helped him find them. Thanks so much to the visitors, interns, and staff who helped make this workshop possible. Have you ever worked with kids on a complicated project before? Tell us how you balanced the kids’ imagination and freedom to be creative with your own guidance and help. This entry was posted in Intern Program, Things We Like. Bookmark the permalink.